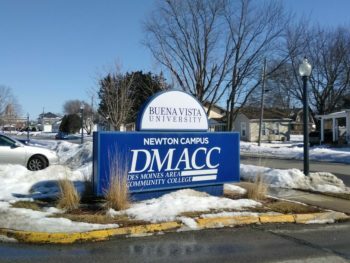 The DMACC Board of Directors voted March 11 at the Newton Campus to allow the administration to arm security. Photo by Sarah Bogaards. The DMACC Board of Directors authorized administration to increase security on all six campuses, including the ability to hire armed personnel, during a March 11 meeting at the Newton campus. Following the board’s unanimous vote, a March 12 press release announced a plan to bring armed security to DMACC beginning in fall 2019. 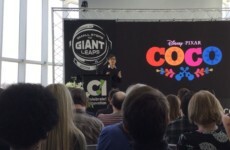 English Professor Lynn LaGrone, a member of the Diversity Commission and the Safety Committee on armed security, said faculty and staff were not notified before the press release was sent, so the fall start date “caught people off guard,” when they learned of it through a Des Moines Register story. DMACC President Rob Denson presented the administration’s recommendation to the board. He said approval would add DMACC to the list of six Iowa community colleges, as well as the regent universities who employ a form of armed security. Several campus and student organizations voiced their concerns about the proposal and how administration communicated the possibility of armed security to students. Representatives from SAC and the DMACC Democrats read statements on behalf of students and both told the board that students have not been adequately involved in this decision. Des Moines native Jessie Bustin is attending DMACC for her associate in science degree and said she represented SAC and all DMACC students at the board meeting. In a prepared statement she said student forums were held in summer 2018 in front of fewer than 40 students on the Ankeny and Urban campuses. Further forums for all campuses were discussed but never scheduled. Student opinions on the issue were mixed, but they agreed there was insufficient outreach from administration for the student body’s input. “If I have to look for [information] like that, then there’s a problem,” said Evan Davis, who is pursuing an associate degree at DMACC, on how students were not kept informed of updates on the matter. He said he would have expected notification via Blackboard or his email. Prior to this vote, the Safety Committee chaired by DMACC’s Executive Vice President Stan Jensen convened beginning in September 2018 to discuss options for increasing security. Its members represented all six campuses and included faculty as well as criminal justice faculty and current security staff. Also, more than 1,000 students, primarily at the Boone campus, received ALICE training. 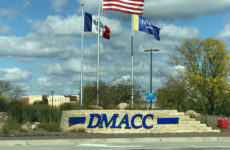 According to LaGrone, the idea to arm DMACC security arose in March 2018 in response to mass shootings nationwide and concern for the safety of on campus childcare centers. However, she said the only opportunity for Ankeny campus staff and faculty to hear about the proposal was after finals in May when many could not attend. At the meeting, LaGrone and Landi Smith, an Ankeny campus counselor, represented the Diversity Commission which said it is in favor of more preventative measures before or in addition to arming security. Among the suggestions in their statement, de-escalation and racial bias training for administration, faculty and staff, and active shooter drills for students were included. LaGrone emphasized the commission’s feeling that mental health was not given appropriate attention in the recommendation and the statement called for a “concrete plan” to implement more services and training. “We lose students to suicide every year,” Smith said. Sweeney echoed suggestions from the Diversity Commission and noted the possibility of unforeseen effects of increased security. “Studies show it’s rather unclear what the effects of armed security on campus are,” she said. Denson said provisions of the recommendation include keeping unarmed security officers on staff who would handle any weapon-free incidences and limiting armed personnel to exterior areas and entrances. After hearing from students and faculty, board members expressed support to increase mental health services. The board’s following press release responded to student and faculty requests, including diversity training and mental health care availability. More representatives will also join the safety committee, however their input will only be applied in terms of the implementation of armed security. Chair Joe Pugel said that the board is “ultimately” responsible for safety on DMACC campuses. Vice Chair Kevin Halterman estimated a timeline of 5-10 years to develop a comprehensive security plan. 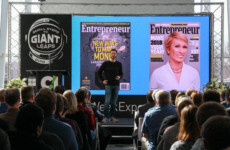 Hannah Bonnett, Paul Robidoux and Ben Breshears contributed to this story.